Whether you knit them toe-up or top-down, getting just the right fit on hand knit socks can be a major challenge! 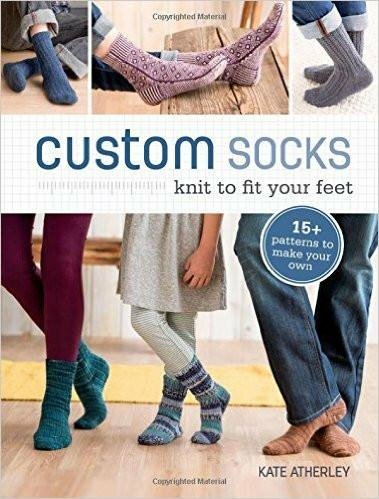 In Custom Socks, Kate Atherley sets out to teach knitters of all levels the skills and tools they need to understand sock fit, and to knit a pair of socks that fit properly. She calls on her years of experience as Knitty's Managing Technical Editor, where she has edited hundreds of sock patterns, to share this information in a way that is easy to understand with patterns that inspire. So go ahead and treat yourself to these 15 original sock patterns that are easily customizable and work with any needle configuration. Your feet will thank you!